It was common practice to engrave memento mori, or reminders of death, on dials and time-keeping devices. This dial has a quotation from the Gospel of Matthew, 'VIGILATE QVIA NESCITIS DIEM NEQVE HORAM' ('Be alert, because you don't know the hour nor the day'). 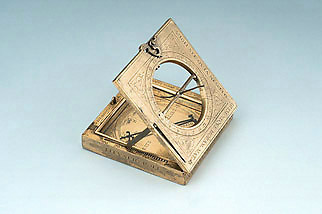 In its square form, this instrument is reminiscent of another dial in the collection of the Museum of the History of Science in Oxford by a maker with Spanish connections, Juan Cocart (see Epact 14859).